Hey, kids, are you ready for another action-packed 3D car cartoon? In this episode, a bad race car causes a funny accident. The police car is tailing the troubler, and accidentally spills a bucket of glue and sticks to the road. 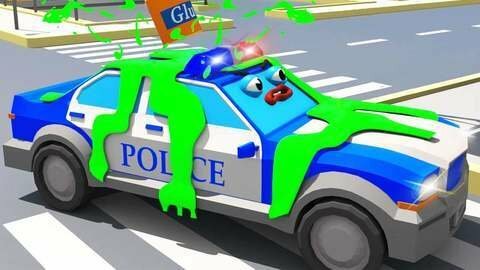 Watch this hilarious police car cartoon to find out what has happened next. If you like this episode browse SeeZisKids for more free online cartoons about cars!